Just ten reviews into the rock era and after yesterday’s first encounter with Amos Milburn we’ve already met the three premier solo stars of the style’s first half dozen years, as Milburn joins Roy Brown and Wynonie Harris in that hallowed triumvirate. It’s nice how neat and clean this stuff works out sometimes, isn’t it? But of the three it’s Milburn who has the least modern recognition even though of those names Milburn had the longest viable career, recording fairly steadily for twenty years and along the way had more overall hits (19 compared to 16 for Brown and 15 for Harris), the same amount of #1 records as Brown and Harris combined (four), and stylistically was a much better songwriter and far more versatile than Harris ever was and arguably as good of a songwriter and perhaps slightly more versatile than even Brown. Oh, and of the three he was the only one who played an instrument and played it damn well at that, as Milburn was rock’s definitive pianist until Fats Domino came along a few years down the line and unseated him in that regard. In other words by all rights Amos Milburn should be an immortal who is known to one and all even seventy years later, for any way you look at it he’s certainly one of the Top 100 rock artists in history based purely on objective measures. Yet his career is shrouded in historical neglect that can only partly be chalked up to the same demographic reasons that affect so many from this era, since both Brown and Harris remain much more well known today, though not even they receive anywhere near the acclaim they deserve. While this negligence is inexcusable it also might be a little bit understandable as we start to take a look at his career as it unfolds before us. This record is indicative of Milburn’s dilemma when it came to securing lasting notoriety and respect. A sly, languid performance, dripping with soul and topped off with a smirk that only makes him more endearing rather than positioning him as a crass no-account horn-dog, My Love Is Limited contains much of what makes Milburn so consistently enjoyable yet also what makes him maddeningly elusive at times as well. When he cut this earlier in 1947 rock was still fermenting in the test tubes, its precise ingredients still being worked out with no guarantee of success. Should the whole experiment blow up though Milburn seemed among the most likely to escape unscathed from the lab explosion because his artistry was more easily adaptable to other already established styles with just a bit of tweaking. True, his best attributes (his pounding hard-charging enthusiasm on uptempo rockers and his soulfulness on the slower numbers) would have less impact in jazz or cocktail blues, the two likely styles he’d have been forced to choose between otherwise, so rock was definitely needed to allow him to explore his strongest musical instincts in a welcoming environment, but he wasn’t entirely beholden to it either should it fail to take off. That more pliable image was an artistic advantage in many ways yet it also meant that he was always struggling to a degree to establish a fully identifiable persona. With this record the slow as molasses pacing is hypnotic, contrasting nicely with the stabbing piano that keeps you engaged… leaning forward in suspense waiting for the next twist. It’s not that you expect the tempo to suddenly race and him to become manically energized but you’re curious all the same as to where exactly he’ll take you, for even at this stage of the game one can tell simply by listening that Amos Milburn and all involved have a remarkable sense of self-assurance about what they’re doing. A game plan that was both well thought out and very precise in its intent. It can’t help but bring a smile to your face, even as he’s essentially claiming to be far more successful with the ladies than most of the guys digging the song probably ever were or could hope to be in their own lives. Yet you don’t begrudge Amos his boast because he’s so disarming while doing so that it doesn’t really come off as bragging. The fact he takes his time throughout all this, holding the crawling pace that pulls you under also helps to take the edge off his ego. It’s so masterfully done that even if you realize what he’s up to you’re almost powerless to offer up any protest. The accompanying music only reinforces this image, as an electric guitar plays some tasty licks in the break but drawing them out to keep it locked in the same mesmerizing groove while Milburn’s piano adds a bit more color yet has much the same effect by lulling you into a sense of calm and comfort even though he’s busy hitting up your girl at the same time. He’s a charmer, both the character he embodies here and the musician he is in real life, the kind who is so good he doesn’t have to break a sweat trying to prove it. Meanwhile Maxwell Davis’s saxophone blows cool and easy behind him shading the atmosphere with deep hues and textures without drawing attention to himself in the process, which makes for the best kind of accomplice for these types of public solicitations, one who won’t be able to remember a single detail of the seduction that is taking place right under his nose if he’s later put under questioning as an eyewitness. Just like that, without any noticeable effort at all, they have you in their thrall. Compare these attributes to both Harris and Brown in something utilizing the same lyrical approach. Harris we know is a boastful egomaniac, someone who would be completely off-putting if he wasn’t so damn entertaining while on the make for any female in a three state vicinity. By the second chorus he’d have likely committed a handful of felonies and been bragging about these conquests to anyone within earshot. Musically he has no room in his repertoire for subtly or discretion and though we haven’t seen these aspects of his persona on Big City Blues, the one record of his we’ve reviewed thus far, it won’t be long before he’s carved out his enduring reputation as the ultimate carnal hellcat in rock. So of course someone like that is going to be far more memorable, especially once he’s got some major hits to his credit to keep his name alive in years to come. Roy Brown, while far less of a one-note performer than Harris, is also far more likely to capture your attention quickly by virtue of his natural vocal style. What made him stand out from the very start on Good Rocking Tonight was how his brand of singing emphasizes the emotional content, wailing away and commanding your attention in no uncertain terms. When in the future he tackles more downtrodden material he pours on the misery in more overt ways than Milburn ever would, ratcheting up his grief to sometimes epic proportions, thereby ensuring that his magnificent voice is always at the center of the listener’s focus. Milburn’s records though are more easy to overlook. They’re emotional pickpockets, slipping up behind you and effortlessly lifting your valuables while you remain unaware of the theft until long after they’re gone. In a world that gives the biggest headlines to mad bomb-tossing anarchists and the musical gangsters who leave a trail of corpses in their wake as evidence of the mayhem they’ve caused, Milburn – at this point anyway – is at risk of not even being called in for the lineup. Even if he were his charm would likely result in the charges being dropped should the witness pick him out. If he were a criminal this would be an asset of course, yet in the rock world it could at times be a detriment, after all it’s tough to be universally hailed as a star when your most distinctive quality may be your chameleon-like adaptability. To that end My Love Is Limited is a record lurking in the shadows, a song for walking home long past midnight with a bit of a buzz on, a smile on your face and a half-focused faraway dreamy look in your eyes. It’s something that you’ll be hearing in your head when you fall into bed before you pass out for the night but come morning you won’t remember any of the hazy details, only the fact you had a real good time while it lasted. This a record I’d never turn down a chance to hear. The mood it creates is as effective on the hundredth listen as the first. I like it even more than Blues At Sundown on the flip side which is pretty darn good itself, even though it too requires some focus to fully absorb its strengths. When presenting evidence as to why Amos Milburn was so good right from the start this would certainly be among the pieces offered to the jury. Yet it’s also something that is probably TOO subtle to be entirely convincing of his greatness. Though the act itself is a difficult one to pull off he manages to do so with relative ease giving the impression that there’s really nothing to it when in fact it requires a tremendous amount of touch, restraint and judgment to do right. In life what’s most easily noticed at a glance tends to be what gets celebrated most readily as time passes and the finer details fade from memory. The extremes are what establishes the boundaries of any style and in rock ‘n’ roll it will always be the extremes which captures the imagination of the public. While this song – and Milburn himself – fit comfortably within those boundaries they will never fully define them and so in the end they remain largely underappreciated, something unfortunately seen by the fact this track isn’t even available on Spotify or iTunes as of this moment for you to hear for yourself. The spell he casts, so effective when you’re under it, inevitably gets broken by the next frantic act to hit the stage, the one making more of a racket and grabbing your attention in more obvious ways while Milburn slips all but unnoticed out the side door. That rock itself has room for both is what gives the style its diversity and thus ensures its lasting impact as a whole, but we know what the camera of history tends to focus on and this generally isn’t it. A pity. 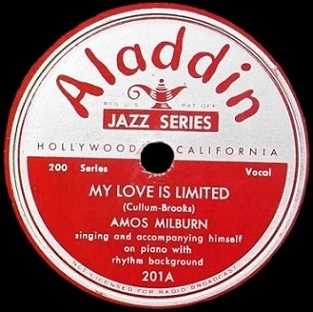 Leave a reply on "Amos Milburn: “My Love Is Limited”"